An easy hike, Lake of the Angels is not. With 3,400 feet of gain packed into 3.5 miles, you’ll be walking uphill most of the way. Even though they dominate the Seattle skyline on clear days, the Olympic Mountains can seem like a world away, thanks to that large body of water that separates here from there. But the trailheads in the southeastern corner of the Olympic Peninsula are closer than you might think, especially when you can avoid ferry hassles by driving through Tacoma and Olympia. An easy hike, Lake of the Angels is not. With 3,400 feet of gain packed into 3.5 miles, you’ll be walking uphill most of the way, sometimes over loose and rocky terrain. For fit hikers who want an end-of-season challenge, Lake of the Angels is well worth the effort. 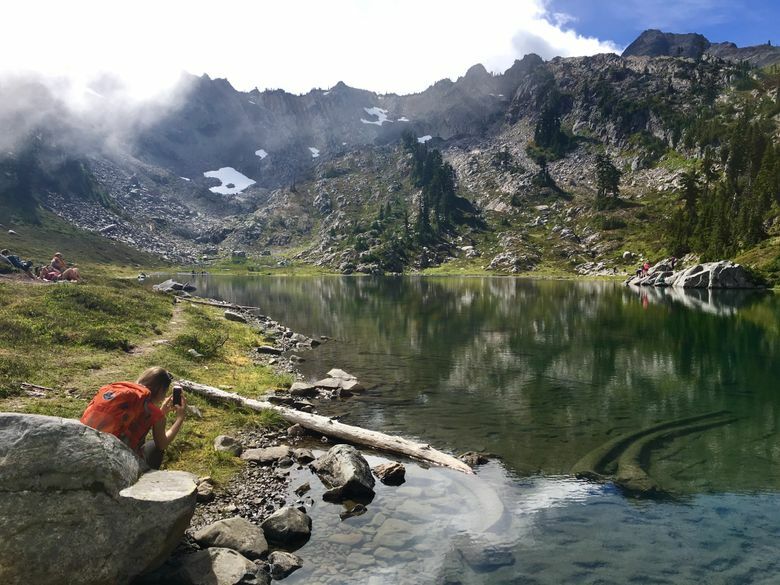 You’ll pass through mossy forests and subalpine meadows, and end up at a gem of a lake tucked into the rocky flanks of 6,434-foot Mount Skokomish. FACILITIES: Parking for about 20 vehicles at a pullout across from the trailhead. Overflow spots along the road. The nearest privy is at the Lena Lake trailhead, 4.5 miles closer to the highway. THE ROUTE: Begin by following the Putvin Trail, named after a trapper who lived in the area at the turn of the 20th century. You’ll soon come to a short spur trail that leads to Carl Putvin’s final resting place, designated with an Olympic National Forest grave marker. The incline begins to gradually increase as you climb through the forest, passing by moss-covered boulders and ferns galore. After 1.3 miles, arrive at a junction with an old logging road. Turn left and follow the road downhill for a few minutes, until you see a trail marker on your right for Lake of the Angels. This is a good spot to rest and refuel, because the real climbing starts here. You’ll soon enter the Mount Skokomish Wilderness, where the trail becomes steeper and rockier, gaining about 1,000 feet in the next mile. The forest also begins to open up; take your time and admire the surrounding Olympic peaks as well as distant views of Mount Rainier. Near the end of this uphill push, the trail leads to a head wall that requires a couple of moves using hands and feet — some scrambling experience is definitely helpful here. After this, the trail veers left and mellows out a bit as you arrive at the aptly named Lake of the False Prophet, a small tarn that sometimes tricks hikers into cutting their journey short. Turn right at a junction here, and then look for a path to the left with a water crossing that utilizes a few small logs. There’s one more short climb to reach your final destination. 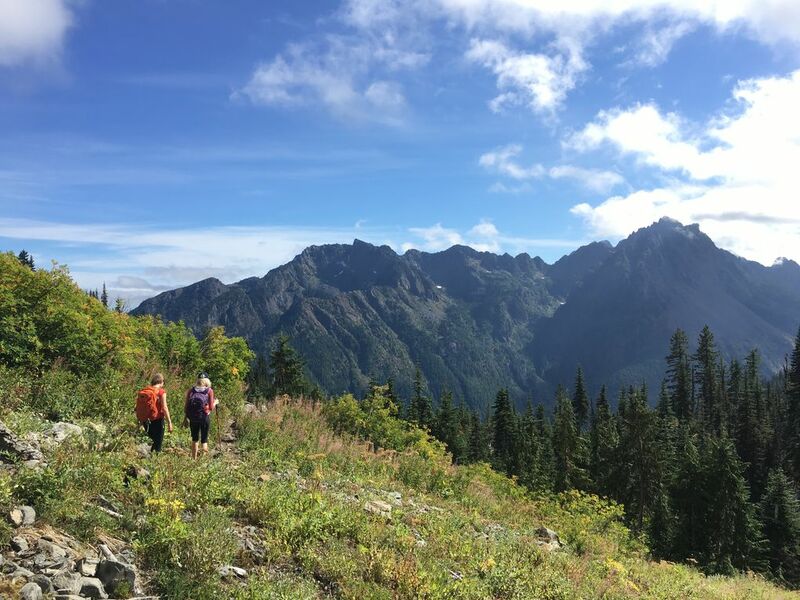 Cross into Olympic National Park and follow the path up a few steep switchbacks until you crest over a ridgeline and arrive at the stunning cirque where Lake of the Angels rests below rocky ledges and open green slopes. My hiking companions and I enjoyed a relaxing lunch here as the fog rolled in and out and cutthroat trout jumped up from the clear water. RESTRICTIONS: Pets are not allowed past the Olympic National Park boundary (3 miles in) and must be on leash before that. A Northwest Forest Pass is required to park at trailhead. DIRECTIONS: Take Exit 104 from Interstate 5, and travel north on Highway 101 along Hood Canal. Shortly after crossing the Hamma Hamma River on an arched bridge, turn left onto Hamma Hamma River Road, following signs for Lena Lake. Drive for about 7 paved miles to the Lena Lake trailhead, then continue 4.5 miles along a gravel road to the Putvin trailhead. The road has some potholes but shouldn’t be a problem for most vehicles. 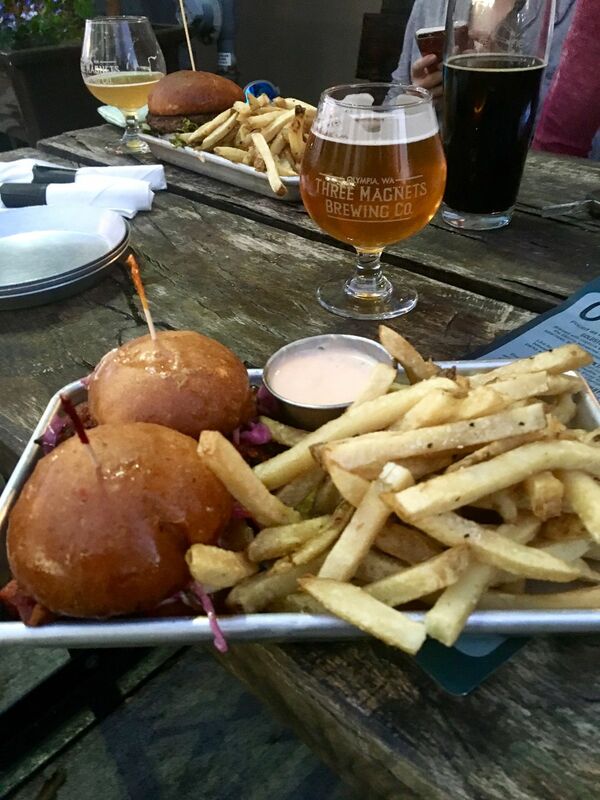 WHY: There’s nothing more satisfying after a difficult hike than the reward of a refreshing beer and juicy burger, and Three Magnets Brewing has a wide selection of both. 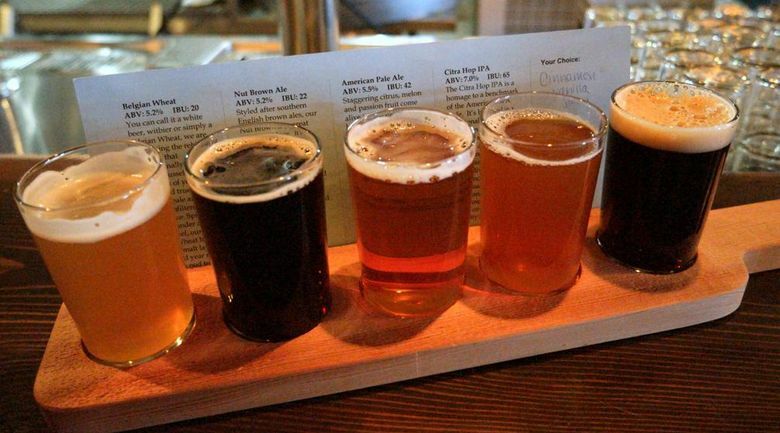 Hopheads can choose from a handful of IPAs and pale ales, ranging from the light and citrusy Rhymes with Citra pale, on up to the Goldstorm Double IPA, a tangy brew with 8.3 percent ABV and 65 IBUs. The “handhelds” section of the menu features several dressed-up takes on the traditional cheeseburger, including one with house bacon jam and another with Gouda cheese and roasted garlic aoli. My sister and I shared the harissa pork-belly sliders with caramelized onions ($14), a delicious if slightly messy option that was served with a generous portion of fries. Happy hour runs from 4 to 6 p.m. and 9 p.m. to close every day, and includes $1 off beer and wine, $2 off cocktails, and 20 percent off small plates and appetizers. A special game day snack menu is available every Sunday; we enjoyed the bacon-wrapped jalapeño poppers ($9), which were breaded with panko crumbs and deep fried. WHEN: Pubhouse hours are 11 a.m. to 10 p.m. Sunday through Thursday, and 11 a.m. to midnight Friday and Saturday. Happy hour daily 4 to 6 p.m. and 9 p.m. to close. As the seasons change at high elevations, it’s a good idea to check on snow levels and forecasts before committing to a particular hike. Visit wta.org to see recent trip reports for various trails, or go to nrcs.usda.gov and search for “Washington SNOTEL” to find a map with data from dozens of snowpack sensors around the state. Remember that weather can change at any time; come prepared with the 10 Essentials, including warm clothing and rain gear, and be ready to turn around if you encounter unsafe conditions. Caitlin Moran is a Seattle-based freelance writer. Email: CaitlinJMoran@gmail.com. On Twitter @CaitlinJMoran.